The term foyer describes a space that usually connects the entrance to various other rooms of house or apartment. However, in time it has become similar to the terms entrance hall, hallway, entryway and even vestibule. In other words, a foyer is a place where you welcome your guests when they enter your home, whether it’s a house or an apartment. Foyer decor is equally important for its beautiful and charming interior. Vestibule (from the Latin word vestibulum, “forecourt”) is a synonym that suggests a transitional area. An earthier equivalent referring to a separate small chamber is mudroom, though this area is often entered through a side door. 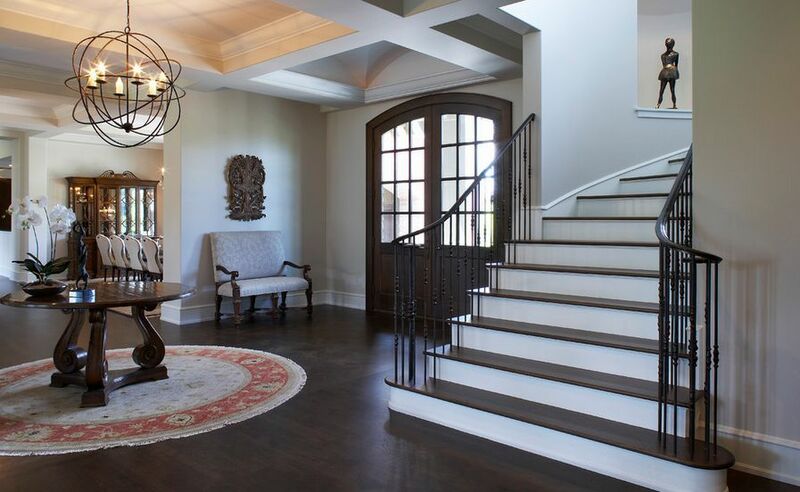 The entryway or foyer is one of the most critical areas to decorate in a home. Part of the reason is that, no matter what size of house we have, it’s virtually guaranteed that we have some sort of entryway that ushers us, our family and our guests from the outside in. Whether it’s a grand foyer or a small door that opens directly into an apartment if you’ve got a door, you’ve got an entryway. Well, some of the houses omit the foyer area and land their entry directly to the living room. The other thing that makes foyers so important is that they are always the first space you experience as you come in. So, the decor, tone and mood of your entryway should connect with those same features in the rest of your decor. The entryways or foyers – whichever you prefer – come in all shapes and sizes and sometimes can be challenging to decorate. And whatever form of decor you need, ensure that your entryway makes you smile, relax or get excited the moment you walk through the foyer. It is essential that it should be warm, welcoming as well as functional. So, now what we know what a foyer is or what it refers to, let’s see how we can decorate this space in different circumstances. A mirror, of ideally full-length, necessary for the final check before we leave the house. If, smaller and hung at eye level can also work wonders. The surface can be a dedicated console table or slim shelf where we’ll sort the mail, leave our keys or anything we need to remember before leaving or on arrival. A welcome mat is crucial for wiping your shoes and keeping your home clean. To this, we can add some functional and aesthetic elements, depending on the size of the entry. This means that the front door of the home opens directly into living area, kitchen, bedroom, or in case of a studio apartment, all of the above. Without even a slim entryway to play with, you’ve got to be greatly creative. This type of entry is usually in a straight hallway, but we might have a bit more width to play with. Furniture items like slim wall-mounted cubbies (small enclosed space) for shoe storage (don’t forget to consider shelving above like the foyer above). Seating in form of a small chair or slim bench another surface to heavily set down shopping bags, and great for sitting & removing shoes. Try a pop of color like the blue pillows above, especially if the room is dark. A “junk-mail” recycler to drop in unwanted papers straight away in it. Other things you can use to decorate include a rug or carpet, a table, wall art and decorative accessories such as vases and various others. When choosing a carpet, consider something with a pattern. Stripes pattern is a nice option. It is simple and will draw guests into the house. We can also add a console table or even a round table which can be placed in a corner or against a wall. Decorate it with a vase or with candles and other accent pieces which are attractive and suitable for the space. A framed mirror could be perfect for the foyer but we can also decorate this space with artwork or with some DIY pieces crafted yourself. Foyer Lighting can be done using Chandelier, wall light of desirable light, color and intensity to enhance the mood while entering the foyer. So, referring to all the basic tips of foyer decor ideas given above, see what size of entrance foyer do you have at your home-whether large, medium or small and try to apply the tips for the better use of foyer space in order to create a relaxing and functional space. Next PostNext Which is the Best Cement for House Construction?